Some of my bento friends asked me on how I made smooth egg sheet a while ago. I'm sorry for the delay of this post but I finally can get all the pictures taken this morning and ready to share it with all of you. Hope this post will be helpful and if there is any other different method to make it, please share it in the comment box. And please note that the ingredients I used for this post were only to make 2 egg sheets. > Mix the eggs with the egg whisker / fork in the bowl. > Mix the 15ml water with 1tsp cornstarch. >Add the mixed water & cornstarch to the egg mixture. > Strain the ready mixture (egg, water, cornstarch) to the new bowl. This step is very important to get the smooth egg sheet. Because when we mix the eggs, we will get a lot of bubbles in the mixture. By straining the mixture, we can get rid all the bubbles in the mixture. If you would like to color the egg sheet, then add the food coloring first before you strain the ready mixture. You can either use the natural food coloring or the artificial food coloring. For this post, I'm using the artificial food coloring. 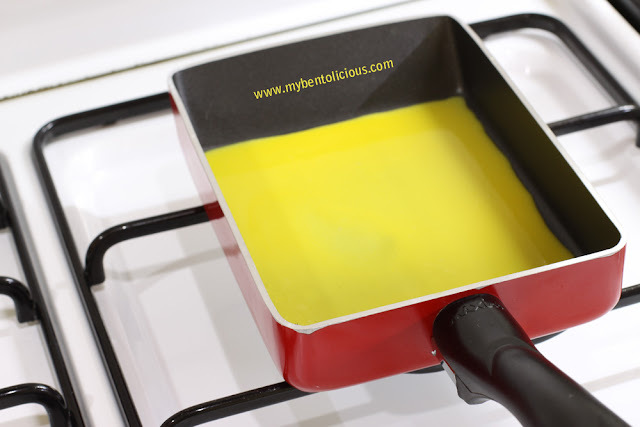 > Put a little bit of cooking oil or spray the oil on the tamagoyaki/non-stick pan. > Use the kitchen tissue to wipe the surface. We don't want the egg sheet too oily. 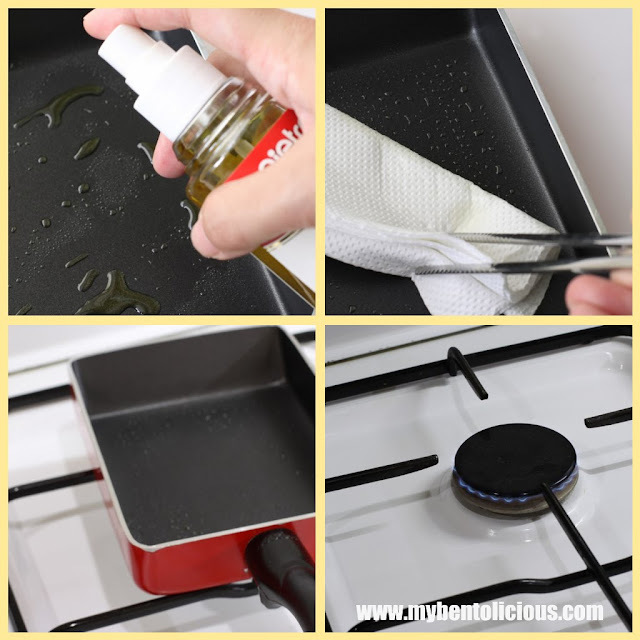 > Use the small burner on your stove and put the tamagoyaki/non-stick pan. This also is very important because you can get the smooth egg sheet by using the small-slow heat on the pan. > Pour the ready mixture into the tamagoyaki/non-stick pan right after you put the pan on the stove. Don't heat up the pan first because you will not get the smooth sheet later. > Wait until you see the smooth top layer harden. Then you can turn off the stove and move the egg sheet to the plate or cutting board. 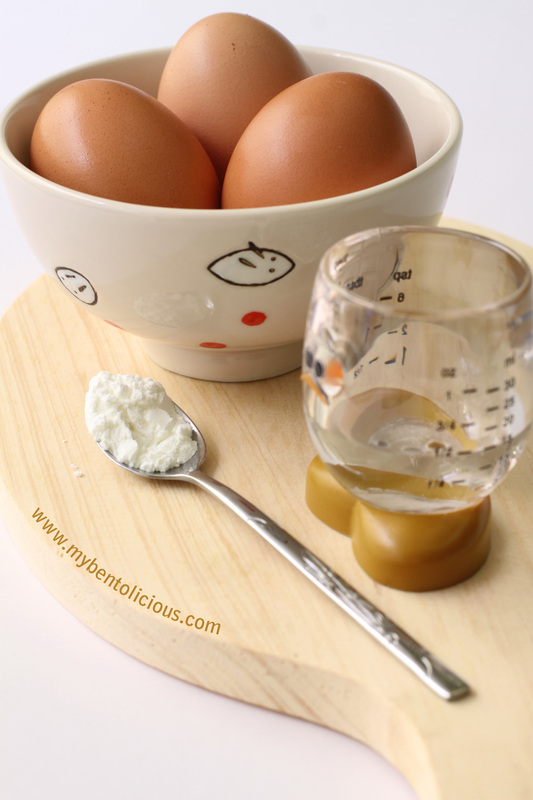 Hope you can try this and have fun making your own smooth egg sheet!! Fantastic tutorial! I am too lazy to strain my eggs so they never come out as perfect as yours do. :) I love those little measuring cups- so cute! What a great tutorial! Thank you for sharing! I'll have to try it out for sure! And you have so cute kitchenware Lia *__* I'm so jealous!! Aren't you simply the best!!!??? Thanks for that really detailed tutorial! I definitely have to try it out as soon as I get my new pan! Finally you post this tips. I always wonder how you get that smooth egg shet. Thanks Lia for very detail photos.. Thanks so much for showing us how to make the egg sheets step by step! I have to go to the store now and buy more eggs so I can try this straight away!! Great post thanks again! excellent detailed tutorial lia -- and i agree with linda on twitter, even your kitchen tools (measuring cup, spatula flipper etc.) are kawaii! i tried to make egg sheets just the other night and it didn't go too well. i guess i have been doing two things wrong: heating up the pan beforehand, and adding the food coloring to the mixture after straining. oh well, i will try again with your helpful tips! thanks egg sheet guru! hope mine can come out like yours! Lia, you're the best!!! I've been wondering how to make these magical egg sheets ;) Thanks! beautiful tutorial. thanks so much! Yay! Thanks for the tip! I am going to do this this weekend. I have a new omelette pan hope that works. I am going to check out you other tips too. I tell you...I'm working on getting this bento thing down pat! Lia, I can never tell if my comment went thru or not -- so best if I leave it via laptop, I guess! @Eula : Thanks a lot Eula! wonderful tutorial even a noob like me can understand hehe... thx for sharing! love the colours. You spent a lot of love and work on your bentos! Wow!! Wat an excellent tutorial! Tks v much Lia for sharing! You are so meticulous and it really shows in everything you do. I simply love love love your cutlery. Where do u buy all these cuties? We are all down with flu again, hope your son is better now? Thanks for the tips mba Lia. Great tips Lia! I'll definitely give it a try one of these days! This is so wonderful, I will be trying this soon! I also HAD to find that egg measuring cup on amazon! 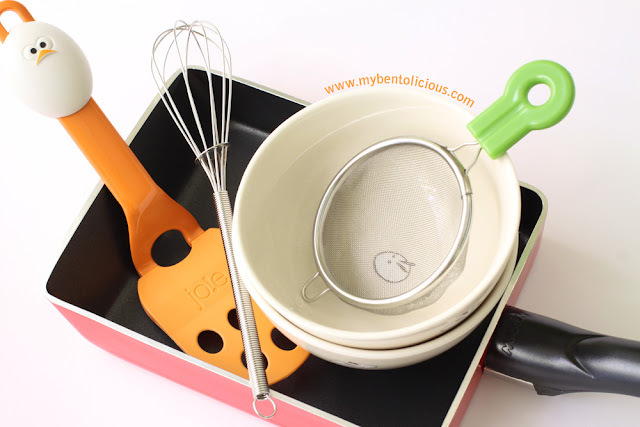 Great tutorial and you have the cutest kitchen accessories I have seen in a long time. 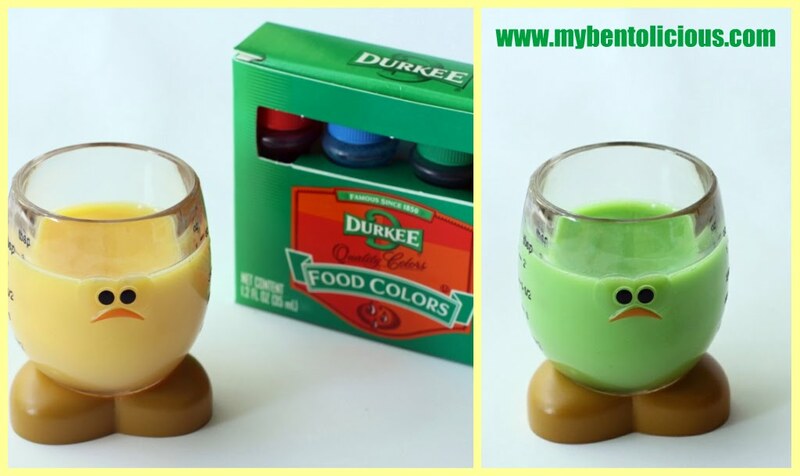 The egg glass with the feet is adorable. You make making eggsheets seem so easy, not sure I'll be as successful though. Love that little measuring cup! So cute! thanks for the reminder about this post. I had forgotten that it included how you got the color. I have to give this a try, I'll let you know how it turns out when I do. One more question though, how long can you keep this in the refrigerator? Is it possible to make the night before? @Kelly Polizzi : Hope you can try and have fun with it! Actually I never put them in the fridge. But I read before that the egg sheet can be put in the fridge for 2 days. thanks, I appreciate the return comments! And your wonderful tutorials! Oh, I definitely have to try this out.. my bento faces will come to life! Thanks a lot!! @Ulla Krause : No worries. Please have fun with it! I know that this is an old post but I can't eat eggs - I've seen pasta sheets used the same way but I don't want to mess it up. Have you done anything on that? I'd love to post this tutorial as part of the November challenges at Bento Blog Network. I would like people here and they would have to create an egg sheet & use it in the bento they post for that week's meme. I'd put it up November 18th. OK! 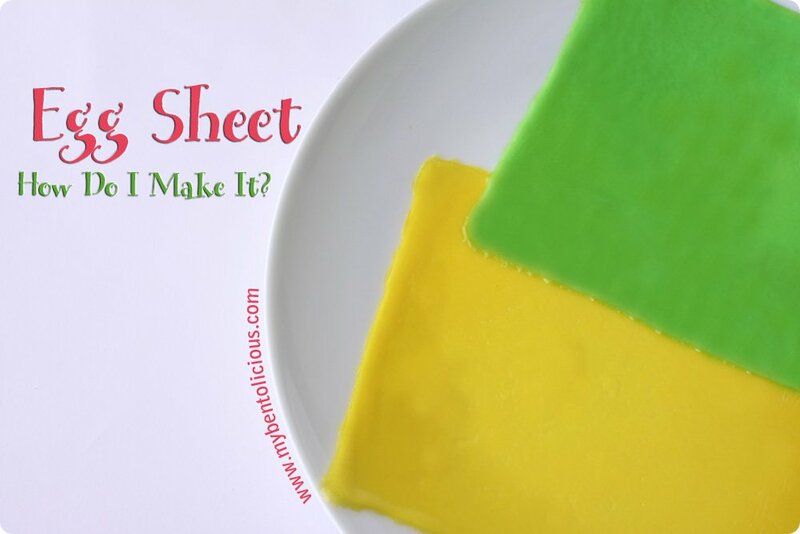 mbak liaaaa... aku tadi googling "how to make tamago sheet" dan sampe sini! Waw, kumplit! aku pengen bikin muka doraemon dari egg sheet.. Biasanya aku ngewarnain lasagna rebus :D ini kayaknya lebih mudah. Thanks! We haven't seen you in a long time. I hope all is OK with you. I was just reading through this tutorial before attempting an egg sheet. Almost time for it to be featured at Bento Blog Network!